1.Preheat oven to 400°. Thinly slice 3 lemons. From remaining lemon, grate 2 teaspoons zest and squeeze 2 tablespoons juice. In small bowl, toss olives, tomatoes, onion, basil, oil, and lemon zest and juice until well combined. 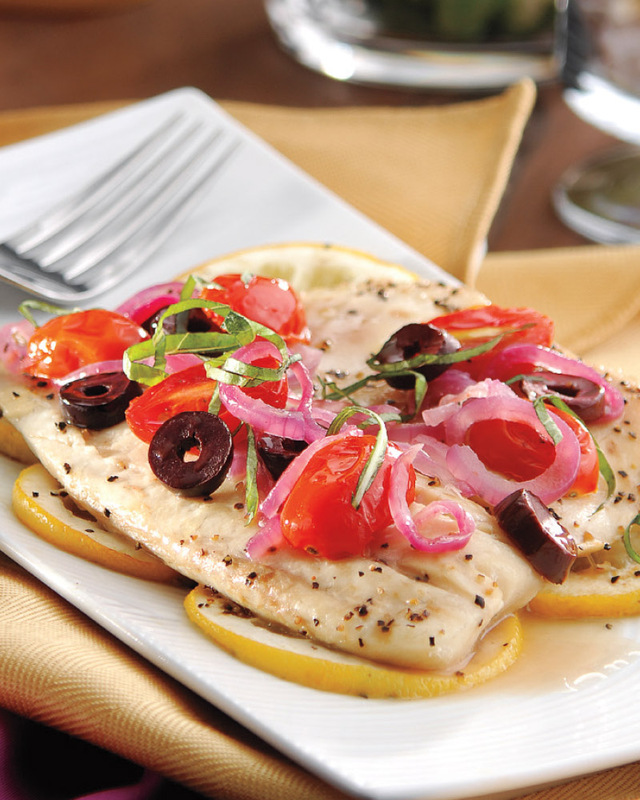 Sprinkle both sides of tilapia fillets with salt and pepper. 2.Cut four 12 x 18-inch sheets of heavy-duty aluminum foil or parchment paper. Place 1 sheet of foil on work surface. Arrange 3 to 4 lemon slices in single layer on half of foil sheet; place 1 fillet over lemon slices and top with about 2/3 cup olive mixture. Fold foil over to cover fillet and olive mixture. Fold edges several times to seal tightly. Repeat with remaining foil sheets, lemon slices, fillets and olive mixture. 3.Place foil packets on rimmed baking pan. Bake 14 minutes or until fillets turn opaque throughout and reach an internal temperature of 145°. With kitchen shears, cut an X in top of foil packets, then carefully pull back foil to open. To make this a complete Mediterranean meal, pair with an arugula salad topped with feta, cucumbers, mint and an oil and vinegar dressing. Serve fish over a bed of whole-grain couscous cooked in low-sodium vegetable broth.